OK, less talk, more walk. so here it is. the sticky!! (will get bigger with time) Please let me know if you would like to submit something!!! - NESICIDE Nintendo Entertainment System Integrated Development Environment. Looks pretty good. and according to the author, it's "Everything you need in one package... "
- ConTEXT A text editor for windows with lots of different "highlighters", including one for 6502 Assembly language. you can get it and the highlighter here, on the downloads page. NES Assembly highlighter(for NESASM by Me (opcodes, registers etc. ripped from Banshaku and Miau's LDFs Notepad++). - 6502 Simulator Can be found here. I remember trying this out a long time ago. I'm glad i've found it again!!! I don't know if this is a new feature, but when you type an opcode, information pops up on the side panel, similar to intellisense!! nice!!! 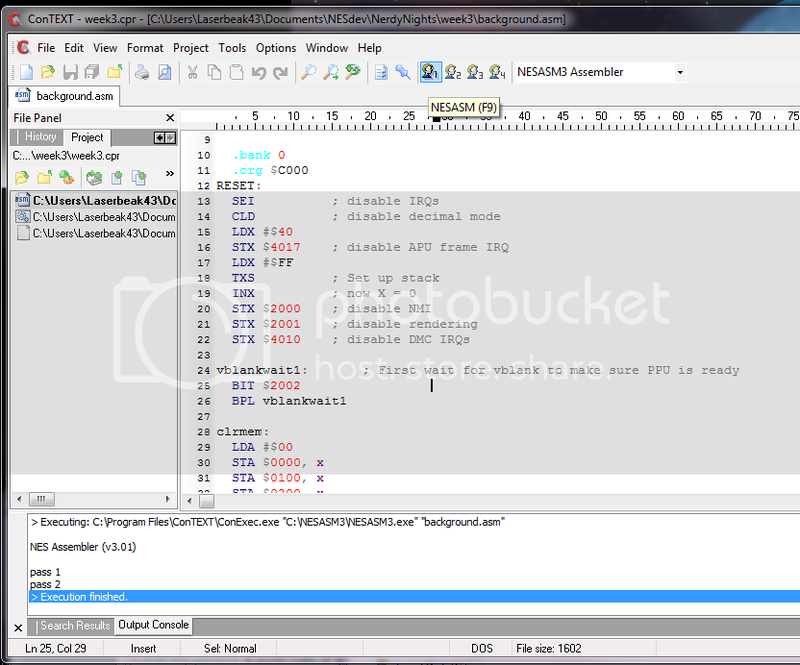 "Integrated macro assembler, simulator and debugger for 650x microprocessor family. Lets you write, test and run 6502/65c02 programs." "cc65 is a complete cross development package for 65(C)02 systems, including a powerful macro assembler, a C compiler, linker, librarian and several other tools." - this site also keeps an archive of ASM demos for PCE or NES on the bottom of the page!!!! NICE I didn't notice that before!!! - DASM - DASM is a versatile macro assembler, written in C, with support for target microprocessors including 6502, 68HC11, 68705, 6803, HD6303, F8 and 6507. 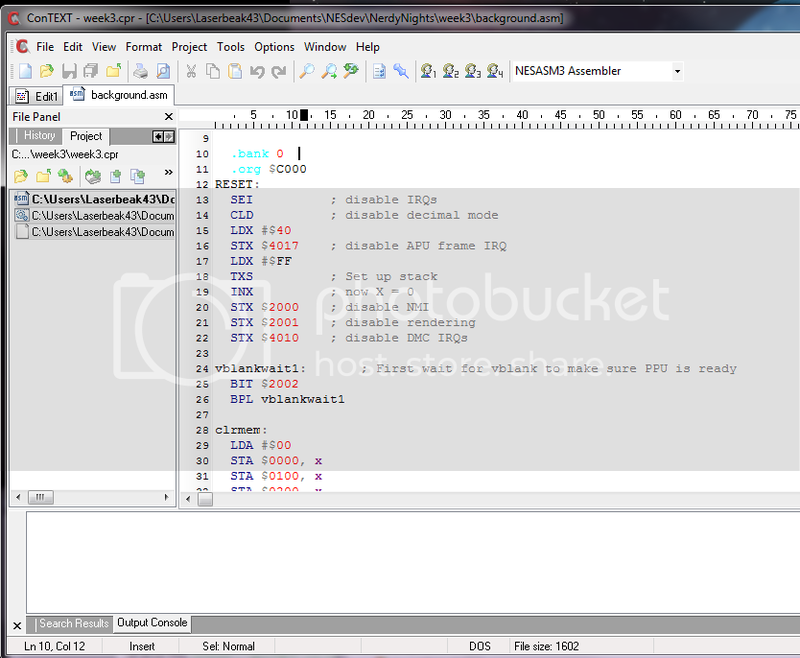 NBASIC is a BASIC interpreter designed to mimic the operation of 8/16bit microcomputers of the early 1980’s like the Tandy Color Computer®, Apple ][e®, Commodore 64®, Texas Instruments TI-99/4A®, and others. - (Celius) A simple WLA-DX NROM setup so people could start coding right away. All you need to do is put the test code under the reset routine. This hasn't been updated in a while, but I just found some docs that I think should be included (though some are already on the main site). - Assembly In One Step CartCollector: "(this is a great read if you're new to 6502 assembly)" Yep, I do remember this one! - Gravity FAQ (must read if you want to make a platformer) Ding! 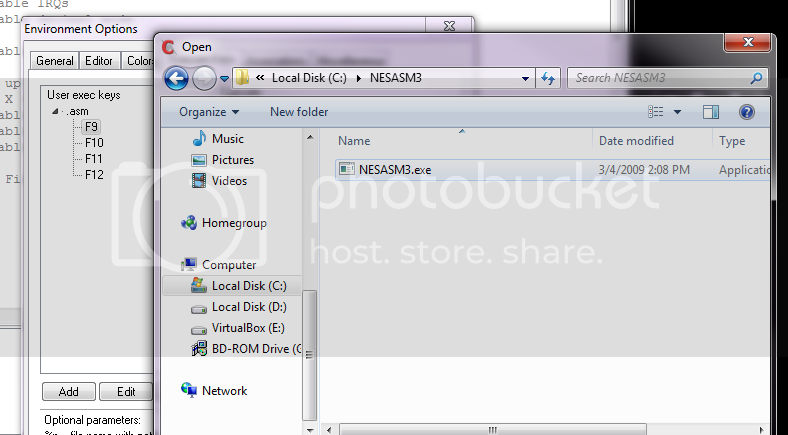 - NESASM Tutorial Can be found here. "New version in the works" according to the author (bunnyboy). - Another by bunnyboy Can be found here. Looks really cool, so get yourself and account and check it out. - Opcodes Tutorial Can be found here. Some cool stuff about Opcodes. - Commodore64 Programmer's Reference Guide Can be found here. - RomHacking.Net List of tutorials contributed by users, categorized as "Assembly". - (electro) Shows us sound lovers how to ask the right questions!!! - (Jeroen) makes his first ROM and contributes the *source* to the community!! Cool points for him! Last edited by Laserbeak43 on Wed Jan 28, 2015 11:00 pm, edited 33 times in total. It would be great to have such a sticky for emulator development. 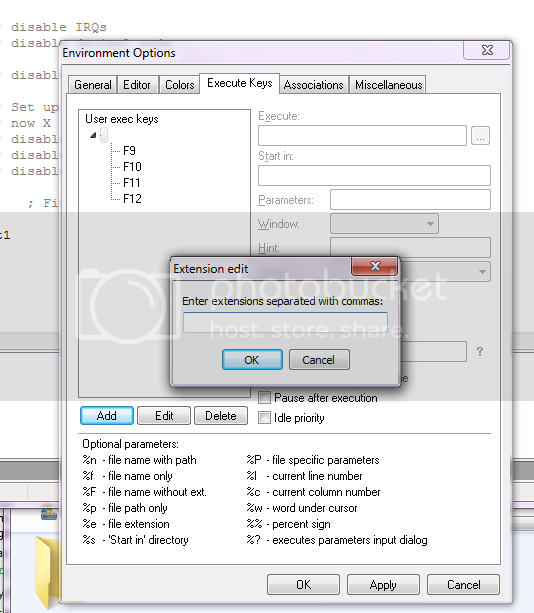 3 - Click the Execute Keys tab, click Add and then type "asm" in the dialog box that pops up and click OK. 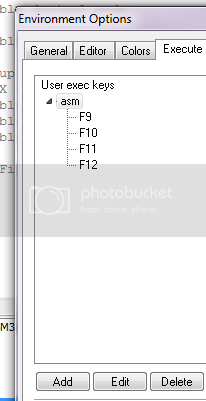 Note: DO NOT prefix "asm" with a "." or this will not work!!! 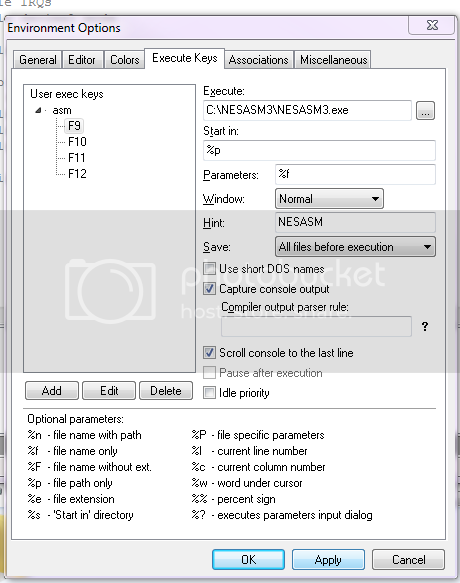 7 - When you create a new project and add files to it, edit and run NESASM, everything will be saved and the output will be shown in the output window! now you can add other tools to the other keys, F10 etc. 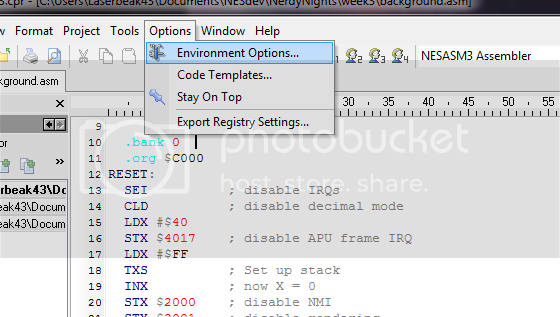 or set parameters for NESASM to your liking. Hope you find it useful!!!! yeah i need to dedicate a section to music all together. i've only heard mention of his nintedulator mod though. Yea, I should have included links. Post subject: NESICIDE LINK = bad? The link to NESICIDE seems to not load, and when it does i get a HTTP 400 Error, anyone wanna look into that? That's the right link, but the page is down. You might want to PM cpow, he is the author. Will context work with other assemblers as well? Last edited by Fatboy on Wed Dec 07, 2011 8:28 pm, edited 1 time in total.